Arrive in Delhi by Air or Train. Then move to Volvo point I.S.B.T Bus Stand at 08:00pm by own. Catch the Volvo then move to Shimla. Overnight Travel. Shimla “The queen of Hills”, capital city of Himachal Pradesh is a popular tourist destination in India. The britishers discovered it in 1819. They used to call shimla their tiny bit of England. Shimla is the largest hill station and erstwhile (Summer Capital of British in india). 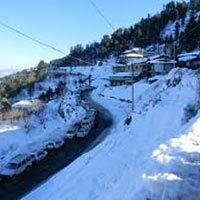 Shimla offer most attractive spots nearby it . Jakoo Hill - The top of the hill is 2 km away from ridge. The Hill of Jakhoo towers over shimla has long been crowned with temple dedicated to Bhagwan Hanuman. Various legends are told of the significance of this spot that Hanuman Ji stopped here while searching for the Sanjivini plant. Advance Study -Indian Institute of Advance Study, This magnificent building, built in Elizabeth Style of English renaissance was completed in 1888. The Mall - One can’t miss the mall in shimla, it is not only a shopping centre but also a well maintained level of about 500m where people spend their leisure hours walking to & fro. Today morning after breakfast at 7-8 am proceed towards Kufri (Including Kufri Fun Campus)..and nearby places like Advance Study & Kufri Fun Campus . Later in the afternoon at 3-4 pm return to Shimla. Then you are free to explore The Mall Road, Ridge, and Scandle Point. Lakkar Bazaar, Christ church and Lower Bazaar. Dinner & Overnight stay at the hotel. Kufri -(Altitude 2622 m) known for its ski runs kufri. 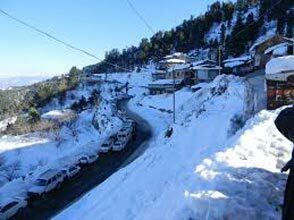 16kms away from shimla, attracts the largest number of tourists who come to shimla it has a backdrop of peaks covered with snow. Today morning after breakfast, check out from the hotel at 7:30 check out from the hotel and say goodbye to “The Land of Gods” proceed to Delhi by AC VOLVO. Tour end with unforgettable sweet memories.